Project Management in Time and Location. 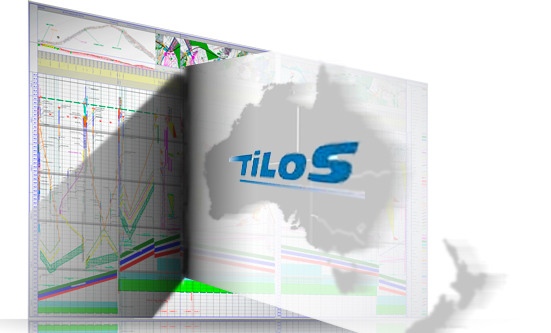 Tilos is time-location planning software for managing linear construction projects. Basically, any infrastructure project where distance is a factor. 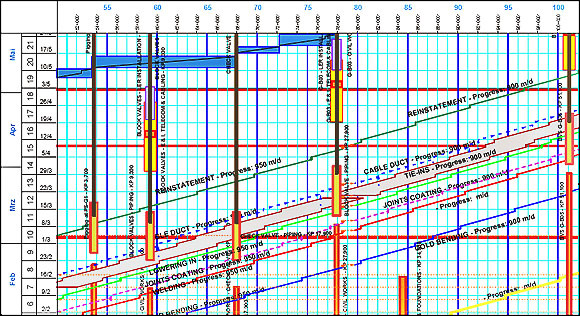 Tilos software can be used for time location planning in different construction industries, like Highway-, Railway-, Pipeline- and Tunnel construction, but also in Water Engineering or Transmission Line Building. Easy to use, yet powerful time location planning software. TILOS is a linear scheduling software that was developed to improve visualization of repetitive tasks when planning and managing major projects. 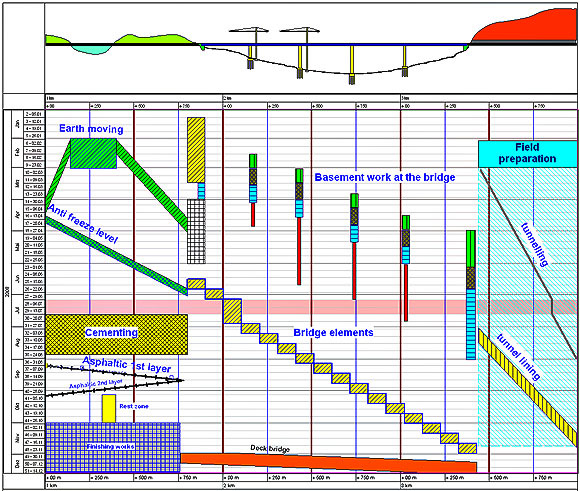 The time-distance diagram supports all highway, rail, tunnel, pipeline and bridge projects. 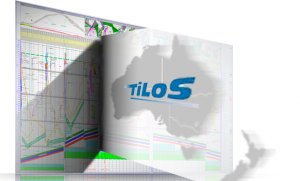 The key benefits of TILOS software are the flow of visual data in terms of time and place on one plan. CPM schedules and network diagrams are more analytical, but they fail to provide a visual connection between the project plan and the project itself. Why is TILOS software far superior to Gantt and Network Diagrams? Neither of the traditional diagrams is able to show a graphical link between the location where the work is performed (the distance axis) and the time when it is executed (the time axis). Linear schedules, generated by Tilos linear scheduling software, can communicate more information because of the way distance related data is assigned to each individual task. The link between site and schedule information enables a quicker and deeper understanding of the construction plan. Site-related data such as elevation and crossing lists help you understand the schedule and to identify constraints. Most data is available well before scheduling work is started. TILOS software can import this data and increase the information communicated along with the plan while reducing the effort of re-entering data multiple times. 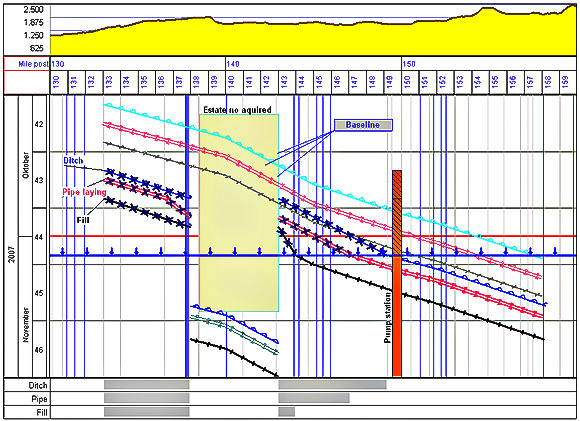 Speed profiles model non-linear productivity rates in different sections of the project such as slope areas, wetlands, heavy rock areas or simply base productivity on learning curves. 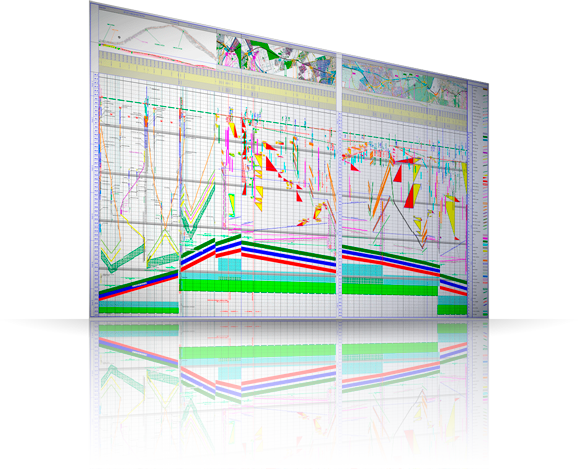 Distance-related graphs such as elevation, slope diagrams or mass haul profiles showing cut and fill sections can be generated directly from profile data. In most project management systems, progress is defined on actual dates and % complete, while the % value is often estimated. TILOS time distance planning software can record progress for each task based on site data and show exactly which sections of the project have not been completed. Progress can be recorded in three methods: percentage based, work-based or distance based. In all cases, precise location information where the work has been completed is required. This progress can be shown with a simple distance-based bar chart, showing completed sections. TILOS is designed for the fast creation of linear schedules making use of predefined work packages in its library. On creating new activities, TILOS is analyzing location data (length) and can immediately set quantity, resource allocation, and duration. The planning work is reduced to a minimum. Drawing on screen: The most natural way is to develop the plan graphically on the screen like you would do on paper. TILOS converts the lines into real-time and distance data. Changes in the dialog are converted directly to the drawing. Insert activity groups: Pre modeled activity groups, that are always performed in one sequence can be generated in one action (e.g. Trench opening – Pipe laying – Trench filling). Import: Import allows the quickest way of creation if those have already been worked out in a CPM based planning system. This option makes sure, that 2 linked activities are always synchronized in location if source activity is changed (e.g. 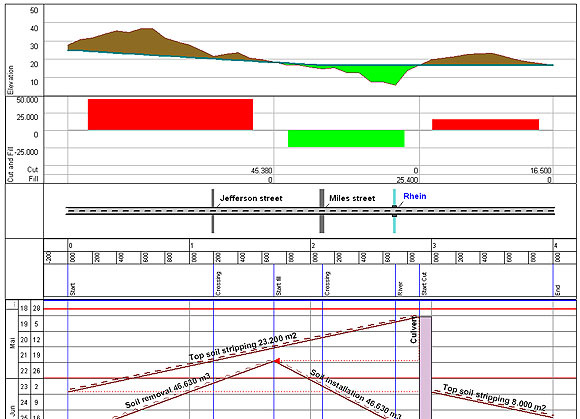 if the length of trench opening is updated, then end of pipe laying gets updated as well). If two teams work at the same work package but from the different side with different speed. TILOS calculates the meeting point automatically by setting an end-end-link.